The OC0A output is used here as a variable audio generator with adjusting the tone's frequency with a potentiometer. Further more 8 bit numbers are multiplied and music is played here. Generating tones is essentially the same as blinking a LED, with frequencies between 30 cs/s and 20 kcs/s (for bats: up to 40 kcs/s). So we learn here not much on timers, only how to attach a speaker to a port pin instead of a LED. To sound tones a speaker is needed. This is attached to OC0A. A capacitor of 47 µF decouples the DC from the port pin and transfers only the AC component. A key and the potentiometer are attached like in the previous experiments. This is the speaker. He has an impedance of 45 Ω to yield a strong audio signal. The two pins are soldered to a short cable and short pins that fit into the breadboard. The polarity of the speaker is irrelevant for our application, it has only accustic consequences if two more of those are operated. This is an electrolytical capacitor. This is a component for which correct polarity is essential. The minus pole is marked, the longer of the two wires is plus. 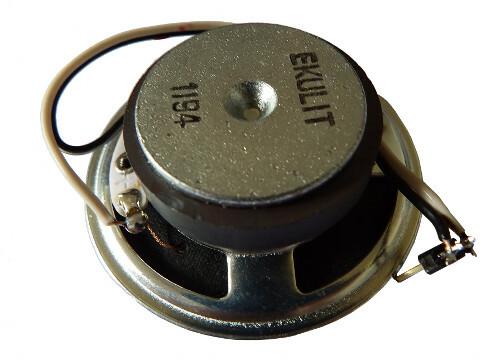 The speaker is tied to pin 5, via the electrolyt. With that we can start sound-generation. 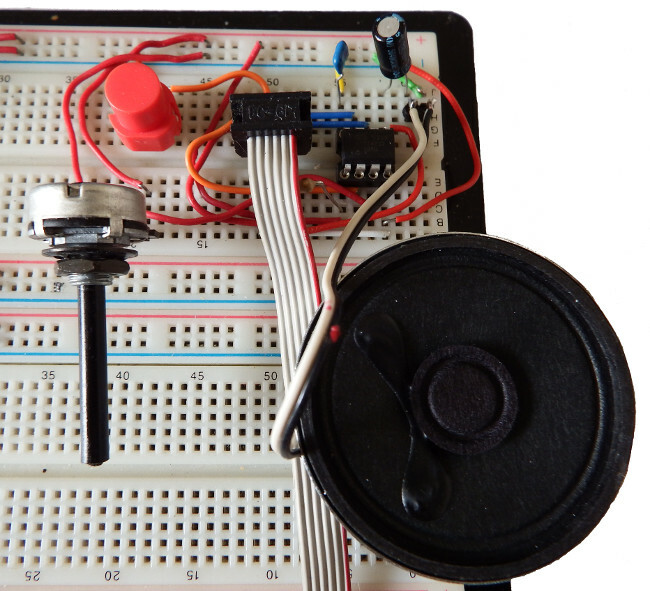 Task 1 is to output audio tones via the speaker and to regulate their frequency with the potentiometer. The tones shall range between 300 cs/s and 75 kcs/s. The tone shall only be audible if the key is pressed. At 1.2 Mcs/s clock, the audible range is well covered with a prescaler of 8. Inverting all bits in a register is a task that the controller's Central Processing Unit can do with a special instruction, see the source code, so that we do not need to take this path. This is the program, the source code here. COM Register: inverts all bits in the register. From 0x00 to 0xFF and from 0xFF to 0x00. Subtract the register content from 0xFF, so called one's complement. With the machine we can generate morse code with a regulated tone. Simulation goes with avr_sim as follows. The I/O port PB0 is set to be output, the output pin is low. The key input portbit PB3 is set to switch on the pull-up resistor. Closing the key pushes the input to low. On PB3 the PCINT enable mask is active and the PCINT enable bit is set. The timer TC0 is set to CTC mode, with clearing the counter after the compare match in A has been reached. The output PB0 is cleared on compare match, leaving PB0 at low voltage. The prescaler is at eight, dividing 1,200,000 Hz to 150,000 Hz counting frequency. The ADC works with the clock divided by 128: 1,200,000 Hz means 9,375 Hz or, for 13 ADC cycles, requires 1.386 ms per conversion. The reference voltage is 5 V. The voltage value of 0.675 V shall lead to an ADC value of 138. The left adjust should yield a MSB of 34 (0x22). The first conversion has been started (the progress status bar is visible). The first AD conversion has made some progress. As the conversion lasts 1.386 ms the controller remains sleeping. yields 0xFF - 0x22 = 0xDD. In that way 38 inverts to 221. With "out OCR0A,rimp ; to CTC TOP port" this is written to the timer's compare portregister. This does not lead to an audible change as far as the "PB0 clear" condition remains unchanged. This changes only if a PCINT is executed. Initiated either by changing the input signal in PINB3 manually or by clicking on PCINT3 such a PCINT is initiated and, after four wait cycles and if no other interrupt request is pending, executed. switch toggling of the PB0 portpin by the timer on. The pin PB0 now is high. Since the last CTC 1.4775 ms have elapsed. The time for two such CTC cycles corresponds to an audio frequency of 338 Hz, something between e1 and f1. With this part of the lecture the gamut shall be played, the potentiometer shall select the tone to be played. Unfortunately german/european/american taste allows only certain tones. Softly changing tone heights are out and not allowed here. We need a table of those allowed tones. Those are collected in the following table. To teach those tones to the controller's timer, the CTC values and prescalers are associated to those tones. As the timer does not exactly fit the desired frequency, the resulting frequencies and the deviation from the gamut tone are also given. The deviations are, all in all, relatively small. I am not able to realize a difference between 440 and 441 cs/s. So we can accept that, without having an extra xtal oscillator of 1.1968 Mcs/s (which is not available anyway). To enable the timer to play those frequency we need a gamut table from which the controller can read the CTC and prescaler values. As the values from a to a', from a' to A, from A to A' and from A' to A'' always differ by a constant value of 2, we could calculate those from a base table. But that would be complicated because of the changes in the optimal prescaler value (at high frequencies above D = 1, at smaller ones = 8). So the table should as well hold the prescaler value together with the CTC value. The table length covers four octaves. the SRAM storage. In an ATtiny13 64 bytes of SRAM are available. The SRAM would be rather full and conflicts with the stack are to be expected., which also uses SRAM. the EEPROM storage. This provides also 64 bytes. That would fit, but would be rather full. the Flash storage. This has 512 words or 1,024 bytes and would provide enough space, even for additional octaves. With the last value to be written the storing with automatic address increment is changed to ST Z,Register, without increasing Z. The opposite instruction, to decrease the address in Z, is also available, but works a bit different. ST -Z,Register the address is first decreased and then the register content is written to SRAM to the already decreased address. Norwegian language constructors know how to confuse beginners. Besides the lengthy procedure to code the assembler source, the SRAM is not a conventient place to locate a lengthy table. The assembler directive ".ESEG" places the resulting code not into the storage flash memory but into an extra hex file named ".EEP", which can be written to the EEPROM directly, byte by byte. At the end of the EEPROM content the directive ".CSEG" switches back into the code segment, so that further instructions can be programmed to the flash memory. The ".ORG 0" directice defines the address place to which the table is written in the EEOROM. The 0 places the EEPROM table to the beginning. The numerous ".DB" directives with the comma-separated bytes are placed to subsequent addresses in the EEPROM. .DB accepts bytes, words or text (ASCII characters in '', character by character). How we access to the EEPROM's content we learn in a later lecture. This is a more comfortable manner, but not as elegant like the third ooportunity. The "8" will be converted to the LSB, the "170" as MSB and placed as a 16 bit word into the program memory. The current address at which this word is stored is given by the label "Table:". All subsequent ".DB" directives place similar words to the following addresses. It is clear that per ".DB" ALWAYS whole words are written to program memory. If ".DB 1" is written to the source code, effectively 0x0001 is written there. The automatic addition of 0x00 as MSB, if the number of bytes placed with a single .DB directive is odd, will be signalled by a warning during the assembly process. In the .DB directive the first byte written is always the LSB. The same warning of the assembler results, if we place text with a .DB directive into flash memory, e.g. with "ABC", and if the text has an odd number of characters. In that case a 0x00 character is added, if we do not formulate this different, e.g. as .DB "ABC ". A second opportunity to construct the table in the flash is by definitely words to the table, e.g. This creates directly the words to be placed to the table, and we can select which part is the LSB and which part is the MSB. Note that the address "Table:" is multiplied by two, because each address location holds two bytes. "2*Table" accesses the LSB. If access to the the MSB is desired write "2*Table+1". This increases the address automatically. Backwards the norwegian programming style is again to decrease the address first and then to read the content, with LPM r,-Z. But beware: this instruction is not implemented in the ATtiny13. By the way, the registers XL and XH as well as YH and YL and ZH and ZL as well as the double register pairs X, Y and Z are defined in the "def.inc" file. If you do not include this in the assembler source header, you will get error messages from the assembler, unless you defined those e.g. with ".def ZH = R31". This has historic reasons because the first AVR devices (e.g. the ancient AT90S1200) had no pointer register pairs. This table requires 29 words in the flash storage, which are 5.7% of the memory of the ATtiny13 and is an acceptable size. ldi R16,0 ; CLR would also clear the carry flag! With that, the storage, the reading and the use of the gamut table is resolved for our case here. One problem solved, but another problem comes up immediately. The ADC provides measurement data between 0 and 1,023 (without ADLAR) or 0 and 255 (with ADLAR). But our gamut table has 29 entries only. We could resolve that by just limiting the values down to 28, and the problem is already solved. That would not be a really nice and intelligent solution, because those 28 different notes would be available within 2.8% of the potentiometer range (10 bit), while note #29 takes all the rest (97.2%). With ADLAR 11% cover 28 tones while 89% covers only one single note, not very much more convenient. Not a real linear coverage, A'' will be seriously overrated. Somehow the incoming 1,023 or 255 should be linearly downsized to 28. The C programmer has no problem with that, he divides by 36.5 resp. by 9.1 and rounds the result. Unfortunately dividing with those numbers the C compiler envokes the floating number library. And this library alone fills the available space in an ATtiny13 completely, and even exceeds that. The C programmer now moves to a 96 pin ATxmega to have enough flash memory for his monster lib. The assembler programmer instead invests a little bit of intelligence and comes up with a much more clever solution, well fitting to the available memory of an ATtiny13. The solution is to multiply the ADC result, with ADLAR set, with 29 and to divide it by 256. As a math formula: "Result = 29 * ADC / 256". Dividing by 256 in binary math is as simple as can be: just skip the last eight bits of the result of the multiplication (or: just ignore the LSB). The problem therefore is reduced to the question on how to multiply the ADC result with 29. Several methods are possible to do this. The 187 clock cycles that are needed are not very long. At 1.2 Mcs/s those are 156 µs, less than a single audio sine wave. The method to add can be used in all cases where the multiplicator is not too large and where the extended execution time is not too large. E.g. in case of 10 it is a preferred method: add the base number once, multiply the result twice by 2 (LSL, ROL), then add the base number again and multiply the result by 2 (again LSL and ROL). In our case the 187 clock cycles are not too much, but there are other methods to multiply that are very much faster. bit 7 of the register to the carry flag. The 22 clock cycles of this mode of multiplication are by a factor of eight faster than the primitive multiplication. But we can do it even faster. The previous methods are tailored closely to the task. The real multiplication, applicable to any combination of two 8 bit binaries, is not so complicated that even C programmer can learn that method (to avoid monster libraries and the associated monster controllers). The binary multiplication is even simpler than decimal multiplication. But let us start with decimal to understand the mechanism. Decimal multiplication goes like this. The first step is to multiply the number with the least significant digit and to add this to the result. Then the number is shifted once left (multiplied by 10), multiplied by the second significant digit and again added to the result. This is repeated until all digits of the multiplicator have been multiplied and added. The binary multiplication is even simpler, because only a 0 or a 1 can roll out. Which means no adding to the sum (0) or adding to the sum (1). The mechanism is the same (to roll out one bit to the right, to add the left-shifted number (or not) and to left-shift the number. The multiplication of 255 by 29 is shown in the picture. The second number (in R16) is shifted to the right, by which the next 0 or 1 is shifted to the carry flag. If that is 0, the first number (in R1:R0) is not added. If it is a 1 it is added 16 bit wise to the result (in R3:R2). Then the first number (in R1:R0) is shifted left (16 bit left shift). Again a right-shift of the second number, to add or not to add, etc. If all ones are shifted out of the second number, the multiplication is ended. The result (28) is now in register R3 (we ignore the LSB R2 = division by 256). Ok, these are 45 clock cycles, and more than method 2. But the routine is processing any 8-by-8 bit multiplication and is not tailored to the 29 in our case. The routine is so simple that even C programmer can learn that, without having to import massive libraries. So our problem is solved on how to make 28 out of an input of 255 (or whatever value the ADC returns). Without dividing (division by 256 does not really count as a division in the binary world). Many mathmatical problems, that require a division, can be solved in that way by avoiding divisions. With that we have the basis to implement the gamut. The program follows, the source code can be downloaded here. tst rmp ; rmp already empty? Besides the already applied LPM instructions in all of its sub variants no new instructions are used here. A serious hint for programming this into the chip: on pin 5 a large electrolytic capacitor and a relatively low resistance of the speaker are attached. Those components conflict with the relatively high serial programming pulses, and error messages from the programmer will result. So please remove the electrolyt first, before starting to program, and plug it in again after this is finished. The simulation with avr_sim shows the following results. Simulated are the multiplication routine and the gamut table access with LPM. To initiate the hardware we step through the first instructions until the interrupts were enabled by SEI. Then we click on the PCINT in the ports display and initiate starting to play the melody. Like in the first case the audio output on pin PB0 is set as output and is cleared. Pin PB3 has its pullup resistor on and the PCINT interrupt mask enables interrupts on both edges. The AD converter is constantly running to measure the input voltage of ADC2, which is on portpin PB4. The input voltage simulated is 3.75 V, which should yield 3.75 / 5.00 * 1023 = 767 or, in the left adjusted operating mode, 191 decimal or 0xBF. After reaching the ADC conversion complete interrupt, the interrupt service routine has written the upper eight bits of the result to register R2 and has set the bAdcR flag. This triggers the routine AdcCalc: after the interrupt woke up the controller from SLEEP. Now we have to calculate which gamut note is selected with the potentiometer. clear rMultH (R3), clear the multiplication result in R0 and R1 and load the number of available gamut tones, decimal 29, to register rmp (R16). Now multiplication can start. shifts R16 to the right and shifts bit 0 to the carry flag in the SREG. In this case the bit is 1.
first check if the carry flag is cleared, and adding will be skipped. Here this is not the case and the 16 bit number in R3:R2 is added to the result in R1:R0. In the third instrcution ADC handles the carry from any overflows to the MSB that might have occurred during the first ADD. shift the multiplicator in R3:R2 one position to the left and multiply the content by two. As R16 is still not zero, the multiplication is continued by shifting the next bit in R16 to the carry flag. This time a zero is shifted, so adding R3:R2 to R1:R0 is skipped. The next step is again multiplying R3:R2 by two, again shift and rotate. There are still ones in rmp, so we have to repeat shifting. With the third shift, again a one is shifted to the carry. Again R3:R2 are added to R1:R0 in 16-bit manner, with ADD/ADC. We do not display the boring multiplication of R3:R2 by 2 that follows next. It is getting boring, but we have to shift rmp again. This time a one is shifted to the carry. We do not display addition of R3:R2 to R1:R0, but this has to be done next. The next adding of R3:R2 to R1:R0 happens here. And the next multiplication by 2 for R3:R2 here. Now the last 1 rolls out to carry, and we are nearly done with multiplication. The last addition of R3:R2 to R1:R0. The following next multiplication by 2 is not necessary any more and makes no sense because R16 is already empty and the multiplication loop will not repeat any more. The stop watch was used to measure the time for multiplication. It shows 55 µs, which is rather fast considering the many steps of multiplication. No need to upgrade to a ATmega with built-in hardware multiplication though, to avoid the necessary time (that we have plenty of) and replacing the 12 instructions of the multiplication routine by just one single MUL instruction. multiply the result of the multiplication by 2 and load the register pair Z with the doubled address of the gamut table. It's address is 0x000049, which is doubled to 0x0092 in Z to access the content of the table bytewise. Now the doubled value in R1, 0x2A, is added to the table address 0x0092. Here, ZL and R1 are added, the result goes to ZL. Then rmp is set to zero and is added with the carry flag to ZH. This ensures that the MSB is correct. Please note that CLR rmp would have also cleared the carry flag, so LDI is a better choice. Now Z points to 0x00BC. , which is roughly the gamut note A' (should be 3,520 Hz). reads the LSB of the table value to R0 and increases the address in Z by one. The result in R0 is written to the timer control register TCCR0B and sets the prescaler to 1.
reads in the second byte in the gamut table, 0xA9 or decimal 169, to R0. LPM always loads to R0 and Z is not increased here. This value is written to the compare match A portregister. Prescaler and compare match A value of timer TC0 have been set and are ready to play gamut tone A' now, but the portpin PB0 is still cleared on compare match and the sound is off. If we write such routines such as the multiplication or the reading from the gamut table, we would like to know if that part really works fine. At the latest if no tone emerges from the speaker when the key is pressed, we know that we have a bug in our source code software. There are opportunities to follow the controller's work step by step and so to search for such bugs and to identify and correct those. The step-by-step analysis is integrated into the Studio and its name is simulator. Those lines mask the reset and vector table if the debug switch is on. With that the simulator loads a test number to rMultL and jumps directly to the routine, without all the other init procedures. The reason is that the int and vector table does not allow to add code lines prior to address 0. We could also change the init source code section to load our test value and to jump to the routine. After the simulator has been started, he offers manyfold information on the interior of the simulated controller. We can look at the content of the registers (below, left), you can start a stop watch counting cycles and execution times (left, middle). The yellow cursor (above, right) points to the first executable instruction. With the menue entry "Step into" (F11) the execution of this instruction is simulated. Executed was the source code "ldi rmp,0xFF", with rmp = R16. In the list of registers the changed value of R16 is marked in red, the program counter is now at 0001 and the cursor points to the next instruction. If we do not want to single step through lengthy code, we can add breakpoints. Those are points in the code where the simulation stops and register values or ports can be examined. Only executable instructions can have a breakpoint, other lines in the source code cannot. To add a breakpoint we set the cursor to that code line and select "Toggle breakpoint" from the context menue. With "Run" in the debug menue the simulator runs until he comes to such a breakpoint. He then stops. In our case of debugging the multiplication routine is of interest and the end of writing the table values to the timer ports. In the first case the register R1 holds 0x1C, which is the expected decimal 28. With those tools we can search and identify errors in our source code. The controller shall play the Internationale when the key is pressed. This has to be played. The original notation of notes, that works with small and large letters cannot be used in assembler because assembler does not know the difference between small and capital letters. This can be conveniently handled. The trailing 0xFF signals that the melody ends here (if that would not be here the controller would interprete his whole flash storage as melody and would play that on and on). cpi R17,0xFF ; End of melody signature? Now an additional 0xFF has to be added to the table to reach an even number of bytes in the table. we add this number to our gamut table and read that out with LPM. As we are lazy and are not willing to divide 24 bit integers by 8 bit numbers in assembler and as we do not want the controller to do that lengthy and boring procedure each time he reads a note, we choose the second option. The C programmer sees no problem here and imports its floating point arithmetic library here, but changes to an ATxmega. Our table now has four bytes per tone and we can start programming the melody. detect the end of the melody and if detected to switch off the speaker output, clear the timer and to re-enable key events. PCINT: To detect the polarity of the key input, if high then set a start flag. TC0-Compare-A-Int: Decrease the 16 bit counter, if zero then set an end flag. Within the main program loop both flags are ckecked and the associated actions performed (start melody from scratch, output next note, etc,). This is the final program, the source code is here. The source code uses one new instruction in a somehow strange way. It is the POP instruction. This copies the upmost byte that was pushed onto the stack, e.g. by a call to a subroutine, and increases the stack pointer by one. If one does that two times and ignores the byte content, the calling address is removed from the stack. A return now jumps to the previous calling address and ignores the last call. Make sure in this case that this is in fact the calling address of the previous call and not a pushed data byte or something else. Simulation uses avr_sim to check execution times of the first two notes of the melody played. With CS01 in TCCR0B the prescaler is 8, the 56 defines the compare match A value. 73 and 1 are the durations of that note, which is 1*256 + 73 = 329. The 3 following the ne1 in the melody table says "increase duration by a factor of 3, which yields 987 CTC cycles (or 0x03DB) and a duration of 987 * 380 µs = 375 ms. The duration 0x03DB is in the double register R25:R24 and will be decreased in the interrupt service routine of the compare match A int. Z is pointing to the next note in the flash (0x0150), which points to address 0x00A8 and is multiplied by 2. This is correct (see the above listing of the melody). This is the time when the registers R25:R24 reach zero and the next note will have to be played. The 379 ms are nearly exact (should be 375). So the prescaler and the compare match A are fine. The duration of the note is now (1*256 + 37) * 2 = 586 or 0x024A CTC cycles or 586 * 380 µs = 223 ms. The counter value R25:R24 is fine, the register Z points to the third note. 250 ms have elapsed, just slightly above the 223 ms that were desired and calculated. The third note is a pause (0xFE). The only difference between a note and a pause is that OCR0A is not toggled but cleared, switching PB0 output to be always low. Simulation is a powerful tool to debug even complex procedures step-by-step and to measure execution times exactly. Use it to test your own designs and to verify that the controller really does what you thought that he should do and in a timely manner.